Many of life’s most intimate minute details can come flooding back at the sight or smell of particular foods. It happened to me recently when I baked some brown bread. I asked my Aunt Cáitín for the recipe Mamó used for her brown bread or cáca baile (bread for the home). It always looked very different to my mother’s brown bread and I remember as a child realising for the first time that baking could be a very individual expressive thing. And also at the time, very much a woman’s domain. Everyone’s brown bread, from my mother’s to Mamó’s, to the headmistress of my national school, to Cáitín’s all tasted completely different despite the fact that they all contained basically the same ingredients. Baking from that moment on became a strange act of alchemy in the oven for me. I never quite knew what was going to come out. I was never much good at baking sweet desserts. That was my sister Eileen’s area. Her strawberry pavlova Swiss roll is a work of art that gets savaged at every family get together. 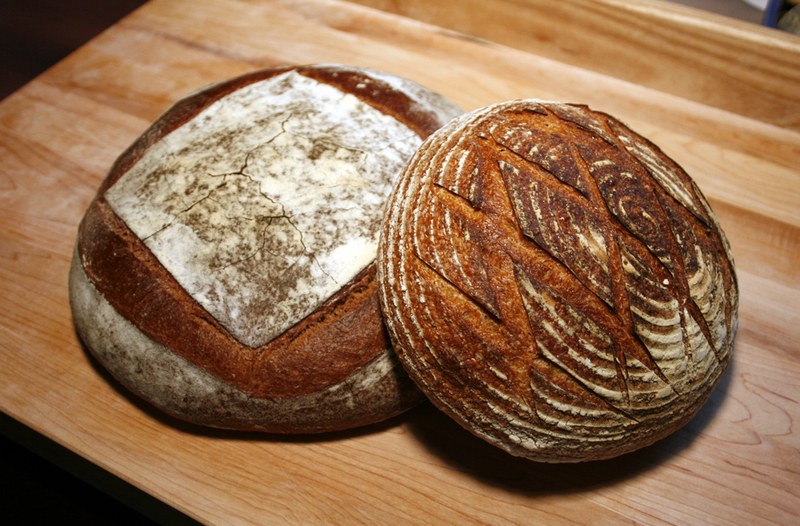 I stayed on the road of bread making and fell in love with flour and yeast experimentation. I’m not very good at that either but the recipe for proper white yeast bread could not be simpler: strong flour, salt, yeast and warm water. You can add extras like garlic and herbs but that is the basic recipe. Yeast is a living thing that can be kept alive in a starter dough for repeated use to make fresh bread, as long as you look after it and feed it. I heard about a French woman who had her starter dough for over 30 years. Mine never lasted the week – a thriving half jar of bubbling goo in the fridge one day to dead as a dodo the next. I end up using dried yeast or if I can get it, some fresh yeast. The kids love making fresh dough and watching it grow and puncturing it with their fingers as it proofs. They love turning it into pizzas or garlic bread or just tasty, properly proofed white bread. Mix all of the dry ingredients together in a mixing bowl. Mix in the water and bring together in a rough dough. Add the oil and knead well for many minutes. If the dough is too sticky, add some flour as you go. Cut and shape the dough into loaves and place in oiled tins or on a baking sheet. Cover with a tea towel and leave to rise in a warm place until doubled in size. This will probably take 40 to 45 minutes. Meanwhile, preheat the oven to 200⁰C/Fan assisted 180⁰C/400⁰F/Gas 6 with a tray of water in it. Use a very sharp blade to score some slits in the top of the loaves and dust with flour to make an extra rustic crust. When the dough is ready, bake in the oven for 25 to 45 minutes depending on the size of the loaf.